On Medium: A Believable Sounding Lie - Who Is Marc Gafni? After taking us into the world of cinema and Disney, in part 2 of their Medium article “Takedown Culture & Marc Gafni: Nancy Levine’s Egregious Con-Job, A Modern Day Gaston From Beauty and The Beast“, the three co-authors Lisa Engles, Kristina Kincaid, William Gazecki discuss the specifics of the campaign against Marc Gafni by modern day Gaston figure Nancy Levine. Levine’s style of ‘journalism’ uses several simple tactics to create a believable sounding lie:. She presents distorted claims as true. Then, based on those false premises, she enlists unsuspecting yet well-intentioned people, to sign off in support, of what appears on the surface to be a noble cause. She relies on fact that people are lazy. 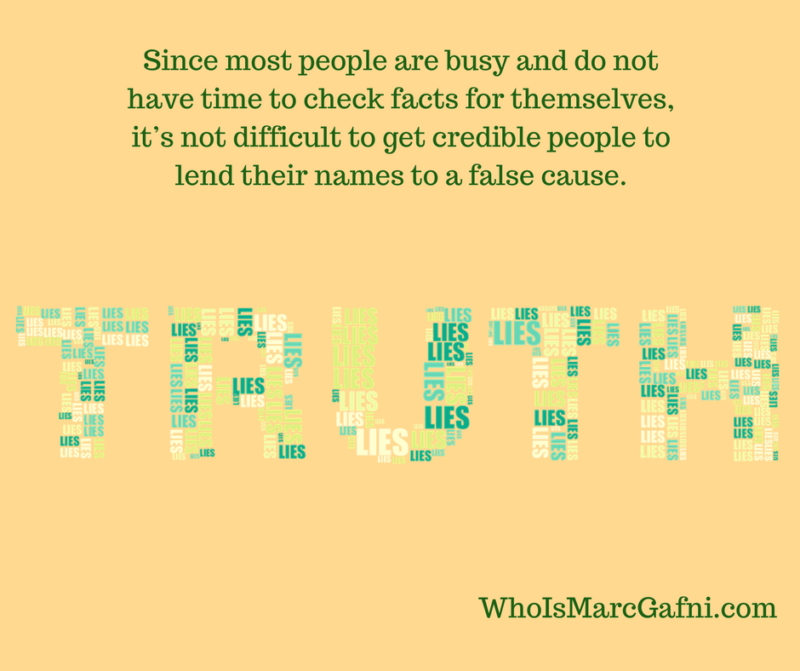 Since most people are busy and do not have time to check facts for themselves, it’s not difficult to get credible people to lend their names to a false cause. In fact, virtually none of the unsuspecting good people who have lent their names to Levine’s attacks have examined evidence or even checked the most elementary of facts or timelines. Levine then manipulatively points to the mis-informed signers of her petition as as social proof for the integrity of her claims. The Internet has no fact checking mechanism making it easy for people like Nancy Levine to sow misinformation in the public space. She uses the guise of ‘victim advocacy’ to justify Sexual McCarthyism. Levine’s particular method of deception as noted, is to flood the reader with ostensibly credible names whose views seem to support her distorted claims. However, a more careful look reveals that her attack is based on false premises and that it and ignores all of the substantive factual information which refutes both the substance and tone of her posts. Levine’s approach is reminiscent of Joseph McCarthy’s witch hunt, publicity stunts that wrapped themselves in the flag of anti communism to create a smokescreen that covered politically motivated character assassinations. She engages in what lawyer Alan Dershowitz calls ‘Sexual McCarthyism’ wrapping herself in the flag of victim advocacy in order to create a smokescreen for nothing less than an Internet-fueled character assassination. As we saw in the last election, when false claims are repeated often enough online, people begin to believe them to be true. We must advocate for true victims of sexual abuse, and there’s no question that it’s high time such incidents are brought into the public eye. We all remember that only a few decades ago, claims of abuse were ignored, and leaders were considered immune from sexual complaints. The fact that we now take claims of abuse seriously represents an important advance in justice. Moreover, we must be willing to challenge sexually abusive leaders — whoever they may be. However, a new abusive phenomenon is emerging. False or distorted claims of abuse are assumed to be true and widely disseminated online. Furthermore, a takedown culture allows politically or personally degraded motives for attacking leaders to be covered up by the flag of victim advocacy. Any mistake is seized on, exaggerated, distorted and then mixed in with false claims for the expressed purpose of character assassination in service of hidden agenda. In this environment any leader can be the subject of a smear campaign intended to “takedown” him or her based on false or distorted claims.